Gordon May's 1953 Bullet as it looked for his Overland to India ride. 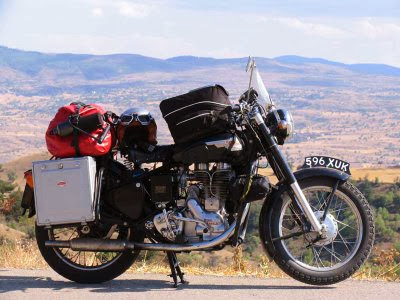 Royal Enfield author and adventurer Gordon May's next long distance ride on his vintage Bullet will be Overland to Africa. "The 1953 Bullet I rode to India has been heavily modified for off-road riding and will be used to carry me from the UK to Cape Town," Gordon announces in the recent edition of his Royal Enfield Books newsletter. It's a challenging new adventure for Gordon, whose 8,000-mile journey from the UK to India on the Bullet made him the world's most famous living Royal Enfield traveler. His Royal Enfield books, including the reference book "By Miles The Best," established him as the leading authority on the brand. "By Miles the Best" covers every Royal Enfield model, year by year, from 1930 to 1970. The recent newsletter announced that he's now assisting another author in research for a book covering the brand from 1900 to 1929. Gordon is such an authority that Royal Enfield chose him as master of ceremonies for the worldwide launch of the new Continental GT cafe racer in September. According to the newsletter, he ran off with the boss's motorcycle and nearly missed the official debut ride from the London's Ace Cafe to Brighton. "Early in the morning, an hour ahead of the official flag off, I nabbed a new GT in order to familiarise myself with it. But whose bike was it that I purloined? The one reserved for Royal Enfield CEO Siddhartha Lal! "What’s more, I missed the turn-off for our meeting point at the Ace Cafe, which meant I sped for many miles further around London’s North Circular. My phone was vibrating constantly as I jostled with heavy rush hour traffic trying to find my way back. "What a relief it was when I made it to the Ace Cafe just before the official send off without having dropped his bike. "The crazy ride did reveal something to me, though: this is a cafe racer that can make it through busy city streets without turning the rider’s hands, wrists and neck numb. That’s good design." Gordon will also serve as master of ceremonies for the Continental GT launch in India. One note: Because Gordon's book covered Royal Enfield so completely from 1930 on, blogger Jorge Pullin built a Royal Enfield Virtual Museum covering the years 1898 to 1929. It's my go-to source for those years. When is the trip due to start?